PETER BOODY PHOTO | The Highway Department finished installing a rock barrier to shore up the embankment of the road to Shell Beach on Friday. The gabions, or caged stones or riprap, of a permanent erosion control project on town property to the south, are visible at right. The Highway Department’s temporary fix for the washout on Oak Tree Lane, the road to Shell Beach, was completed Friday. Crews over the past several days have brought large rocks from the site of the old town highway barn on Route 114 to the washout, which was caused by tropical storm Irene last month. They stacked the rocks stacked against the embankment as a temporary barrier to protect the road. Highway Superintendent Mark Ketcham said Oak Tree Lane was to be reopened late Friday after having been closed since the storm. A few years ago, after a 2007 storm caused a washout, the town completed a federally funded erosion-control project on town property to the south of the current work site, which is on the property of the Silver Beach Association. 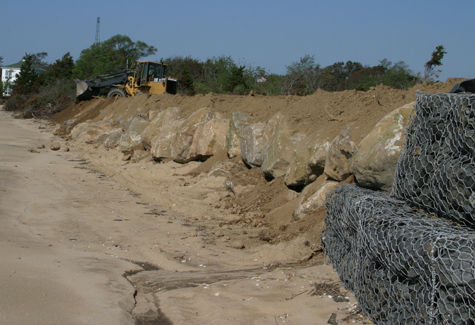 The gabion system —riprap in a wire caging — installed then ends just south of the washout caused by Irene and cost $620,000. The town and the Silver Beach Association have been in talks to plan a long-term solution to the continuing erosion threat. Mr. Ketcham said the temporary fix should protect the road for two or three years.